Topography describes the physical features of an area of land. These features typically include natural formations such as mountains, rivers, lakes, and valleys. Manmade features such as roads, dams, and cities may also be included. Topography often records the various elevations of an area using a topographical map. Topography studies the elevation and location of landforms. Landforms - Landforms studied in topography can include anything that physically impacts the area. Examples include mountains, hills, valleys, lakes, oceans, rivers, cities, dams, and roads. Elevation - The elevation, or height, of mountains and other objects is recorded as part of topography. It is usually recorded in reference to sea level (the surface of the ocean). Latitude - Latitude gives the north/south position of a location in reference from the equator. The equator is a horizontal line drawn around the middle of the Earth that is the same distance from the North Pole and the South Pole. The equator has a latitude of 0 degrees. Longitude - Longitude gives the east/west position of a location. Longitude is generally measured in degrees from the Prime Meridian. A topographical map is one that shows the physical features of the land. Besides just showing landforms such as mountains and rivers, the map also shows the elevation changes of the land. Elevation is shown using contour lines. When a contour line is drawn on a map it represents a given elevation. Every point on the map touching the line should be the same elevation. On some maps, numbers on the lines will let you know what the elevation is for that line. Contour lines next to each other will represent different elevations. The closer the contour lines are to each other, the steeper the slope of the land. There are a number of ways that information is gathered to make topographical maps. They can be divided into two primary methods: direct survey and indirect survey. 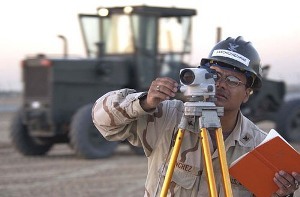 Direct survey - A direct survey is when a person on the ground uses surveying equipment, such as levels and clinometers, to directly measure the location and elevation of the land. You have probably seen a surveyor along the road sometime making measurements by looking through a leveling instrument sitting on a tall tripod. Indirect survey - Remote areas may be mapped using indirect methods. These methods include satellite pictures, images taken from planes, radar, and sonar (underwater). What is topography used for? Agriculture - Topography is often used in agriculture to determine how soil can be conserved and how water will flow over the land. Environment - Data from topography can help to conserve the environment. By understanding the contour of the land, scientists can determine how water and wind may cause erosion. They can help to establish conservation areas such as watersheds and wind blocks. Weather - The topography of the land can have an impact on weather patterns. Meteorologists use information on mountains, valleys, oceans, and lakes to help predict the weather. Military - Topography is also important to the military. Armies throughout history have used information on elevation, hills, water, and other landforms when planning their military strategy.